Cibele was created by Nina Freeman under Star Maid Games. She’s worked on Gone Home as well as created many other small games, which you can play here. Her most well-known one might be how do you Do It?, which you can get on Steam for free. She’s also working on the upcoming Tacoma along with the rest of the Gone Home team. As soon as I read the description for Cibele, I instantly thought of two men from my past. I’ll change their names and call them John and Jack. I “met” John during my senior year of college through a mutual friend who graduated before me. He lived a state away. We started “talking” in January and ended up settling on meeting in April. We talked every day and had more in common than any guy I had liked before. I was absolutely thrilled until, two weeks before he was set to visit, he abruptly canceled his trip and told me we had to stop talking to each other, that I was coming on too strong, that I was too clingy. I was devastated. We started talking again, just as passionately, around New Year’s Eve. It ended again when he found a girlfriend. We’d never labeled ourselves. We’d never even talked on the phone, just texted. I learned a lot from that relationship, mostly about myself, and made some changes. I “met” Jack on Twitter last year, and he was a mutual friend of someone I’d also met online. He lived on the west coast, and we started talking in January. This evolved into texting, phone calls, and Skype sessions. At one point he referred to me as his east coast girlfriend, and even confided that he’d talked to one of his friends who was in a long distance relationship about how she made it work. We made plans to visit, and he stayed with me for a week in May. After he left, I barely heard from him, he didn’t return any messages, and he kept putting off Skype calls. I agonized enough that I was making myself sick, and finally called him in July because I had to know, one way or the other. He told me he didn’t want any commitment, probably ever. Again, I was devastated and was really hard on myself for being so naïve. Why do I share all this with you? Because I want you to know how true this game is. All the feelings of those relationships flooded back when I played this. I think that if you’ve had an internet relationship with someone, Cibele is going to hit home for you. 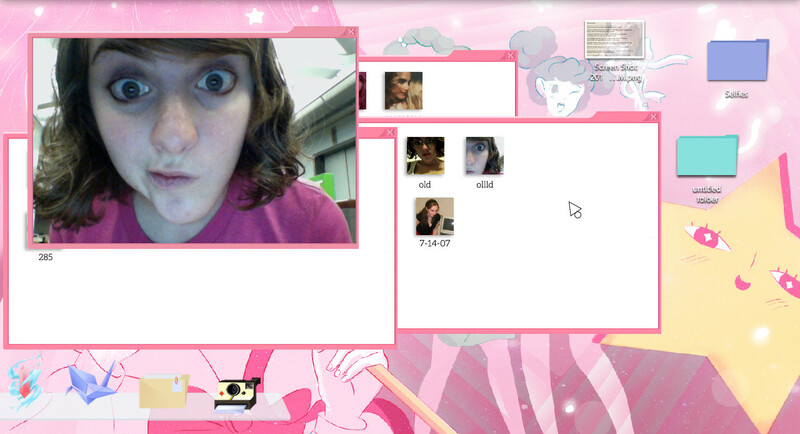 You play as Nina Freeman (playing herself in FMV sequences), and you’re able to poke around her desktop. We’re the same age, as I found out in a LiveJournal-esque profile, which made it even more relatable. Being able to look through her folders and find pictures, poetry, profile backups, e-mails, and chat logs made Cibele incredibly real. The main plot of the game advances when you play Valtameri, an MMORPG where Nina meets a boy named Ichi. They have voice calls during the game, but don’t do a lot of talking about the game itself. (You don’t have to do anything complex while you listen to the conversations – it’s just clicking on enemies. The pathfinding can be a bit wonky at times, but that’s not why you’re here.) E-mails and IMs from friends will pop up while you’re playing too. Nina and Ichi’s relationship unfolds as time goes by, and I became incredibly invested. I found myself anxious when she brought up a loaded question, holding my breath as I waited for him to answer. The game is only about an hour long, but the story is well worth it – especially because I think so many people will be able to see themselves in it. Get Cibele from various platforms (Steam, DRM-free, and itch.io) for $7.64 until November 9th, when it will go up to $8.99. You can follow Nina Freeman on Twitter here. And don’t worry – my current long distance relationship has been going strong for nearly a year.